Paphiopedilum wardii is a gorgeous olive green Asian Slipper Orchid native to Myanmar and southern China. I have always admired its coloration. But what's the story with the glistening bumps above the flower's pouch? 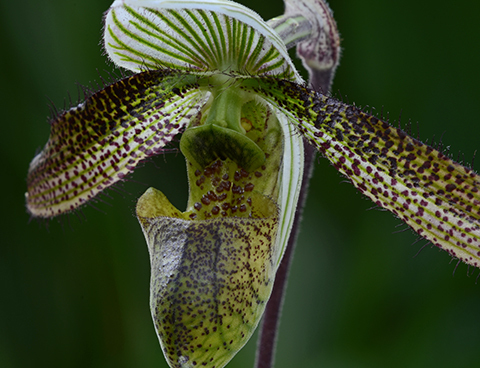 Several species of slipper orchids in the genera Paphiopedilum and Phragmipedium are visited by female hoverflies (Syrphidae). Female hoverflies select aphid colonies as brood sites for egg laying and their larvae eventually devour the aphids. 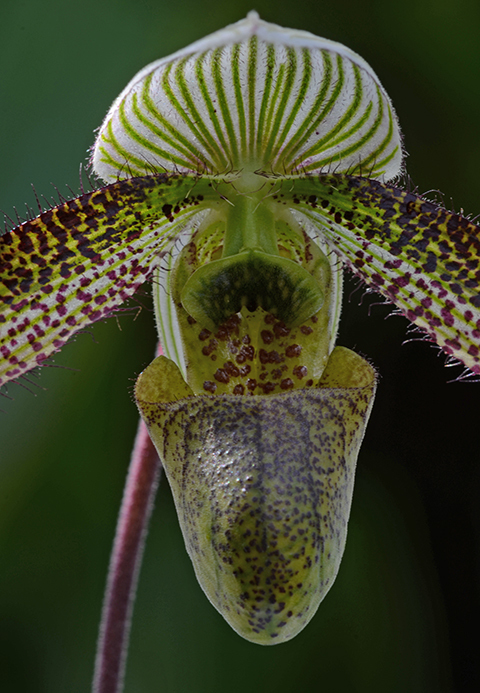 John Atwood has observed hoverflies laying eggs on Paphiopedilum rothschildianum's staminode, which has raised glandular hairs. He concluded that the glandular hairs appear to the hoverflies to resemble the bodies of aphids. 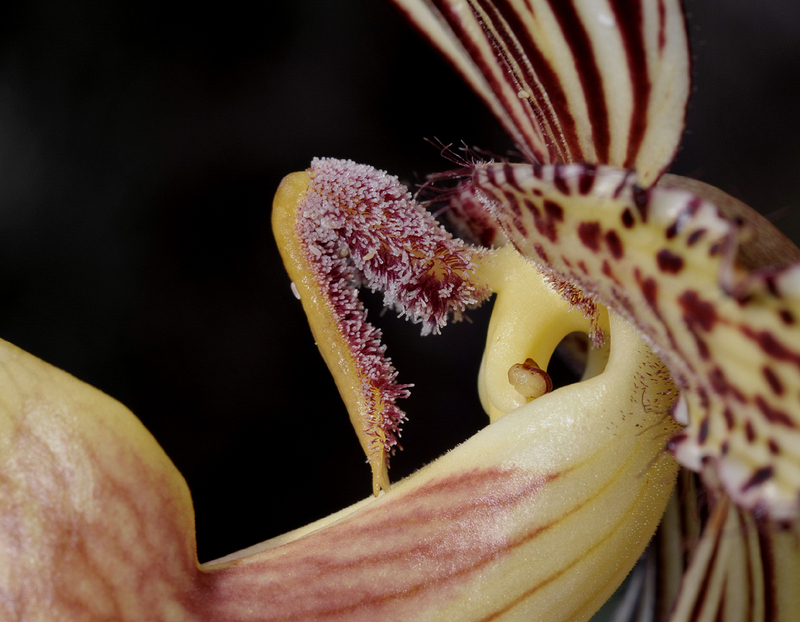 Atwood also observed the female hoverflies pollinating the orchid. This phenomenon--the attraction of female insects to false egg-laying sites in flowers --is called brood deception pollination. Recently, Robert Pemberton has made several observations of hoverflies picking up pollina from Phragmipedium pearcei. Calaway Dodson also noted pollination of Phragmipedium longifolium by a hoverfly. Like most species of Phragmipedium, these two species have spots above the lip. It seems likely that the spots on Phragmipedium flowers attract hoverflies and facilitate brood deception pollination. 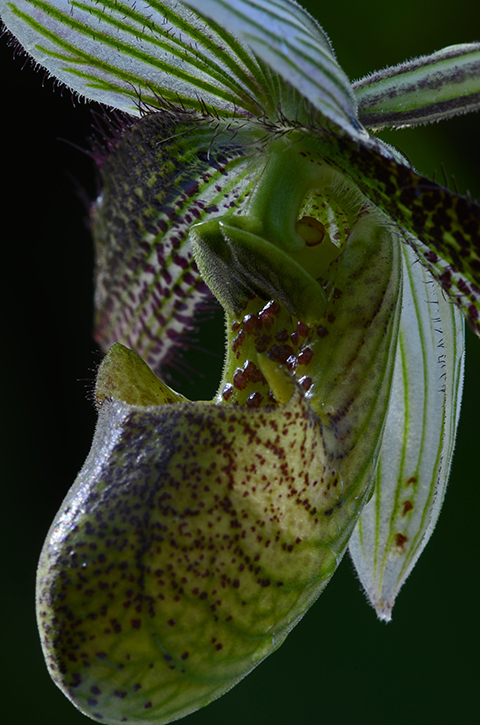 Is Paphiopedilum wardii pollinated by hoverflies? Is it pollinated through brood site deception? I don't know, but those glistening bumps would seem to suggest so.